This month we welcomed the latest cohort of entrepreneurs for FAB Accelerator. This 12-week programme is now in its 4th cohort and gives people with great business ideas everything they need to get their plans in shape. Shaw Gibbs has supported the programme since it launched last year. Meeting the new participants reminded me that Oxford really is top for business, especially startups and scale-ups. As accountants we work with many more funding-stage entrepreneurs than we were five years ago, helping more business owners to put the right financial structure in place to enable growth, and to provide the guidance and accounting services to help them succeed. 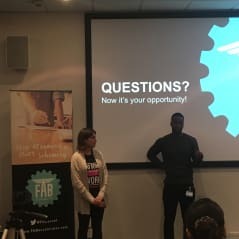 The entrepreneurs who join FAB are choosing one of the best types of support programmes around as it is (tirelessly) run by entrepreneurs for entrepreneurs. The core team Gary, Heather and Ben work with a host of business owners, expert marketers and financiers, who all help entrepreneurs think clearly about their value proposition, their target markets and their rollout plans. In a little over a year, no less than 36 entrepreneurs have graduated from FAB Accelerator. The feedback from alumni is always amazing and there are already some real success stories. Helen Wright used FAB Accelerator to develop her plan for 9-2-3Jobs, a recruitment agency which specialises in jobs for skilled candidates who want flexible hours. The firm now has over a thousand candidates on its books and many are, like Helen, parents of school-age children who want to use their skills in a flexible working environment. Helen was at the House of Commons this September to launch the 9-2-3 Club where she called on all businesses to advertise their next hire as a flexible one. Clean energy startup Stroom Energy and winners of Fab Cohort 3 has won funding through the ESA Artes programme. Watch this lively interview with founders Christophe, Anoop and Tom about how FAB helped them to drive their business forward. So as FAB4 gets under way, we’re looking forward to seeing more entrepreneurs get their business ideas into shape, ready for take off. Meanwhile if you want to find out more about Shaw Gibbs, drop me an email - sarah.gardener@shawgibbs.com.